Since things have cooled down a bit and I need to get back into the habit of writing, I’m gonna kick off this month with an article that touches on a few factors that I believe are important for anyone wanting to maintain a lean appearance at all times of the year. I’ve never been a fan of the bulk and cut approach. An approach often taken to the extreme by some of my peers, with the net result being that they only look decent during the summer months. Simply not my style. Perhaps it’s a consequence of growing up fat. Perhaps it’s because I’m more impressed by feats of great relative strength, for which leanness is critical. I’m not sure. It is what it is, like the saying goes. Once I cut down to 5.5% body fat by late December 2007, I decided I wanted to stay that way if it was possible. Possible in this case meaning if I could maintain my sanity, social life and not feel miserable. I questioned the possibility since I failed many times in the past. Sure, I got plenty lean before. That wasn’t the problem. 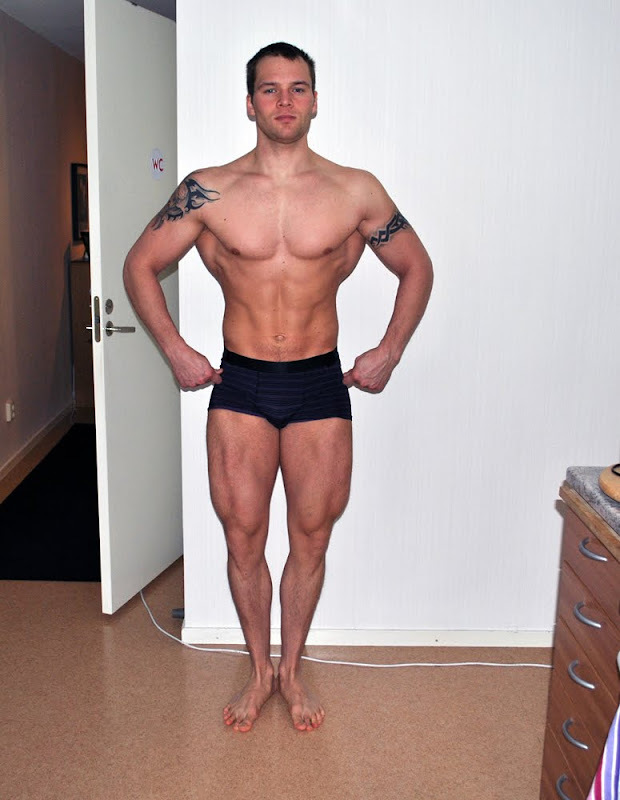 I managed to get very lean for shows and photo-shoots back when I was modelling. Getting there wasn’t the problem. Staying there was. But I’d come a long way since my semi-starved modelling career and had managed to adopt a new perspective on things. It would prove to be crucial for my success this time. This is my current condition. I’m a little heavier than I was in October, but not by much. I use and work with four different approaches to intermittent fasting. All of them entails a 16 hour fast followed by 8 hours of feeding. 3 meals usually, 2 or 4 meals less usually. Fat loss. Maximizing fat loss and minimizing muscle loss. Lean gains. Maximizing muscle gain and minimizing fat gain. Bodyrecomposition. Simultaneous muscle gain and fat loss. Lifestyle (or maintenance). Incorporating intermittent fasting as a lifestyle diet that is very sustainable in the long run. The difference between this and other approaches are in the form of much looser guidelines and lessened focus on macronutrient and calorie-cycling. Slow bodyrecomposition can still occur. The diet changes depending on what my clients favor, but they have many things in common. There’s a system to it – specific guidelines for each approach. There’s no guesswork. I’m fairly specific. Left are the lowest common denominators that I believe are conducive to maintaining, or achieving, the lean state. I will cover a few of them below. One of my clients, Andreaz, after months on a lean gains phase. As you can see, he remained lean throughout the whole process. Weight gain was slow, but fat gain almost non-existent. This picture was taken a few days before we switched to a fat loss diet. Well, this one was fairly predictable. Nevertheless, it needs to be addressed first and foremost in this article since it played such an important role for me. Intermittent fasting was a key factor in allowing me to stay very lean and looking great 365 days a year. It was the golden ticket. While I don’t think intermittent fasting is for everyone, it released me from the chains of feeling the need to eat every 2-3 hours. It spared me the torture from having to be content with tiny kindergarten-style meals that would only leave me wanting more. Some people may feel differently. Maybe they feel “just right” after a small meal every so often, and maybe they maintain a low body fat doing just that. But I never really felt satisfied with that approach. I always failed when I tried, and I tried for years. I did 5-6 meals of 400-500 calories or so and still felt like I was dieting. Sooner or later I’d blow my diet and overeat (a lot). I prefer to eat big. When I eat, I eat. When I don’t, I don’t. That’s how I’m wired and trying to fight against my natural inclinations always caused me to fail. Intermittent fasting is in my opinion a very effective way to maintain some hedonism in your life while staying lean. I’m able to eat awesome meals (some go as high as 2000 kcal) without adding body fat. I wouldn’t be able to do that on the six-meal-a-day-diets I tried to maintain on in the past. I never get cravings anymore. I don’t fiend around for snacks. I don’t need them. The foundation of a diet conducive to maintaining and achieving the lean state needs to be built on a few specific dietary fundamentals. My framework contains a few rules that I adhere to most of the time. Following these rules makes maintenance of the lean state possible and enjoyable. These dietary fundamentals can be said to establish a low body fat settling point (not the same as set point). This is what you can control to make sure you remain lean despite not having the genetic makeup for it. I sure don’t. I grew up fat. But with the following strategies, I’ve remained very lean for years now. And it feels great. However, I should note that these rules are meant to be broken from time to time. Life will come in the way some days. Flexibility and a non-rigid mindset are important traits to make this work. Robert has been on a lean gains diet for almost four months without any noticeable fat gain. He’s made substantial strength gains despite only gaining 4 lbs. Some people rely heavily on cardio in order to maintain their leanness. This allows them to be somewhat more lenient with their diet. I am however no fan of cardio and don’t use it to stay lean. In my view cardio as a strategy to maintain a low body fat percentage is not only time-consuming, but also a sure-fire way to hamper muscle and strength gains. If nor time or muscle gain is a concern then by all means continue your cardio regimen. But considering my priorities and those of my clients, I focus on the macrocomposition of the diet to maintain the lean state. You’ll often hear that 1 g protein/lb body weight is a good guideline for muscle gain. That’s true. Studies show no additional benefit in going higher than that, assuming adequate calorie intake. But protein has other important qualities. I put great emphasis on it in every diet I design and believe it needs to be kept higher than the generic guidelines. First and foremost, the effect on satiety is far superior to both carbs and fat. This ensures good diet compliance, since you won’t get hungry and risk overeating. Secondly, TEF (Thermic Effect of Food) is much greater for protein than for both carbs and fat. It’s so significant that a researcher named Livesey proposed that protein should actually be counted as 3.2 kcal and not 4 kcal as the current guidelines state. In simple terms, in comparing two hypo-energetic diets at the same calorie intake, the diet with the highest protein percentage of total calorie intake will show superior results. Last but not least, a high protein intake is absolutely crucial during fat loss if you want to optimize retention of muscle mass while losing weight. A high protein diet is a key strategy to prevent overeating and warding off fat gain when attempting to gain qualitative weight. For fat loss additional benefits arise in terms of greater satiety, accelerated fat loss and sparing of lean mass. Most of your diet should consist of whole and unprocessed foods. One critical mistake people make when transitioning from dieting to (failed) maintenance or a muscle gaining diet is changing the food composition of the diet significantly. Out goes the fibrous veggies and whole food protein and in comes the refined carbs and protein shakes. Such foods invite overeating sooner or later. Most people don’t have a problem gaining weight, they have trouble keeping it off – especially after dieting and reaching a low body fat percentage. What you ate during your fat loss diet, satiating foods like veggies, fruit, berries, meat and cottage cheese, should also be a staple of your diet regardless of goal (muscle gain, bodyrecomposition, lifestyle). And minimize liquid calorie intake. Chew your calories, don’t drink them. While I’m not big on supplements, there are a select few that should be added to your diet if there is a need for it. For example, calcium increases fat excretion and Vitamin D plays an important role for metabolism. Making sure there is no lack of these micronutrients is therefore conducive to maintaining the lean state. For more on this, check out my supplement guide where I list the stuff I consider useful. Calories and macronutrients: timing and cycling. I’ve talked about this numerous times on the site, but in short I believe macronutrient and calorie cycling is an important part of a proper intermittent fasting setup. I’ve mentioned the potential benefits with regards to partitioning in the past, but this time I’d like to put a little more focus on the behavioral aspects. Simply put, there’s a tendency for people to go lax and take too many liberties on diet setups and don’t cycle phases of over-and underfeeding cycles. And then there’s the fact that people simply get more productive with a lessened focus on food on rest days – they get stuff done. But this effect is unique for the short term. It’s certainly not something that occurs with prolonged dieting, where thoughts of food may become overwhelming and obsessive. I actually prefer to have a few dieting days now and then. I’ve noticed I am at my most productive during those days and I certainly don’t experience “dieting” symptoms such as increases in hunger. Some of my clients get anxious about attending social events, such as big family gatherings, parties and weddings. There will be tempting foods, maybe alcohol and various snacks and they will likely deviate from their diet. And when some people deviate from their diet, they lose control and overeat (usually on a plethora of sub par foods and snacks). Learning how to tackle social events that involve eating is therefore important for anyone wanting to get lean and remain lean – unless you plan on living your life like a hermit. These events can be made into smaller issues with a good dose of self-control. But I can’t assume that everyone is able to “eat in moderation.” No, I have special strategy for such occasions. Assuming the event is in the evening, and that the client initiates his feeding phase around noon, I tell them to eat their full allotment of protein for the day before attending the event. They should keep everything else low; fat and carbs are consumed in whatever low amounts that are contained in the high protein foods eaten before the event. This creates a big caloric buffer for social eating AND ensures that the client comes to the party reasonably satiated and less prone to eat a bunch of junk. Consider this easy and non-challenging strategy yourself. It has been a great help for myself and many clients. I follow intermittent fasting to maintain a shredded physique 365 days a year. For me and many others, it’s an excellent way to enjoy dietary freedom without feeling deprived and constrained to your diet. I maintain a high protein diet and cycle carbs and fat depending on day. I chew most of my calories and my diet consists of whole foods primarily. By doing this, I’m rarely hungry and the diet is enjoyable and varied. I also believe that there physiological and behavioral benefits to macronutrient/calorie-cycling. I’m flexible and never let my diet rule my life get in the way of enjoying myself. Remember, it’s the diet that you maintain 80% of the time that will dictate how you look. Not the occasional indulgences. There are easy strategies for tackling social situations, such as saving up for a “caloric buffer” later in the day. So that’s all for today. There’s a little more to it, but I might save that for another article. Or my book, whenever the hell that will be out.